Since I moved in with my boyfriend at the end of last year, I have got much more into cooking. Not to sound too clichéd but I really enjoy cooking for him. I lived on my own for nearly 10 years, and to be frank, could be satisfied with some toast for dinner – it’s way too much hassle to cook (and wash up!) for one. So I rarely bothered. Maybe some super-quick pasta, but that was about it! Now, not only do I have someone to practise cooking on, but he appreciates it too. When we met, we did that typical thing of going out to eat a lot, and not doing much exercise (Fig. 1)… as a result, we both put on a fair bit of weight. So, when we moved in together, we turned over a new leaf and now we do low/no carb meals in the evening. No bread, white potatoes, rice or couscous, though we do eat fake grains like quinoa and sweet potatoes. OBVIOUSLY this is not a stringent rule and when we are hungover, all bets are off (= pizza). But I have loads of recipes and meals I make now, mixing it up and changing things I find, to make lots of tasty, healthy evening meals. Why am I writing about this? Well, you all know I try to keep it on-topic with my blog, but I do do foodie posts and recipes, albeit not for time. But when Waitrose wrote to me and asked if I would put together a summer salad recipe for their Great British Garden Party project, I thought it sounded like a fun challenge. So here it goes! 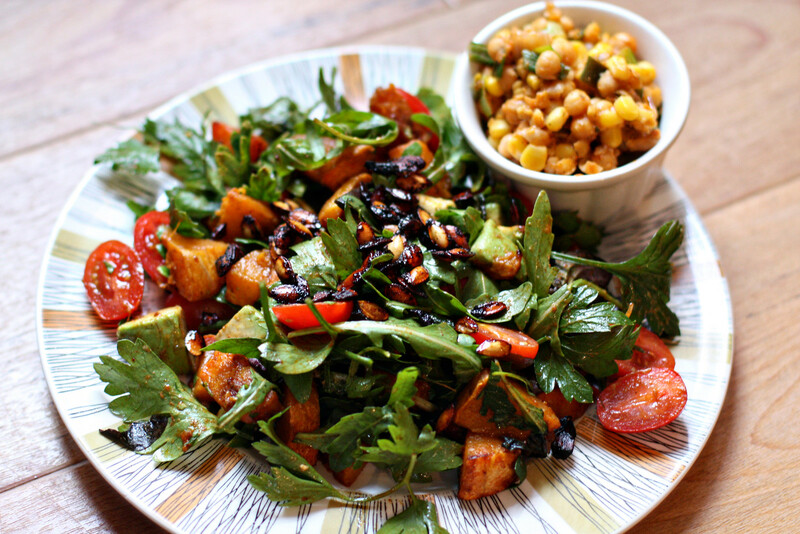 Warm Summer Salad with smoked paprika squash and avocado! This salad has lots of lovely contrasting textures and flavours but is substantial enough to fill you up! I’ve topped it with sweet & spicy roasted squash seeds – waste not want not – plus an optional chickpea side to make it more filling. This is a Frankenstein-esque combo of recipes I’ve absorbed from all over the place over the years! Preheat the oven to 200ºC. Peel and chop the squash into bite-sized cubes, keeping aside the seeds. Spread the cubed squash over a baking tray or two. Drizzle with olive oil and sprinkle with the smoked paprika and cinnamon, mix it all well to ensure it’s coated. Wash the squash seeds and pick out the stringy bits. Put in a bowl, drizzle with olive oil, salt (I used a little garlic salt too), a sprinkle of chilli and a dash of honey. Mix well and then spread thinly on a baking tray. Put it all in the oven and roast the squash and the seeds for 20 or so minutes until the squash is soft. Then, take a big mixing bowl and chuck in the whole bag of leaves, plus a load of parsley (it’s so good for you – the amount is dependent on how much you like parsley), your halved tomatoes and the chopped avocado. When the squash is done, let it cool for a few minutes, then add to the bowl. Squeeze your other half a lime in and mix well. Dump on a plate and sprinkle with the roasted seeds (which are definitely not slightly burnt and meant to look like that, honest). Eat! 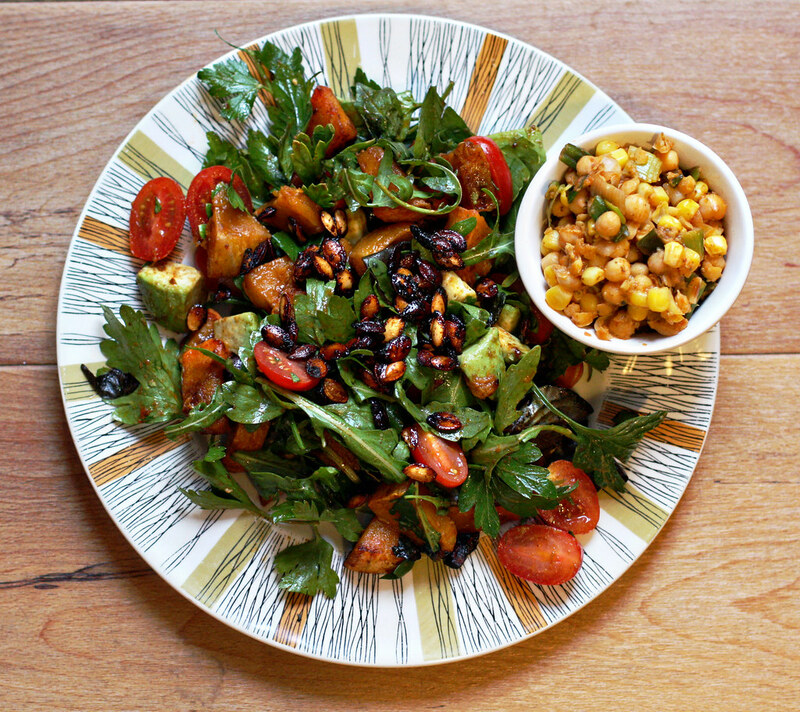 The mixture of textures and complementary flavours work so well in this salad. The soft squash and creamy avocado contrast with the crispy seeds and spices, and the sweet tomatoes with the fresh leaves and parsley taste super fresh. You don’t need any extra dressing because the leftover olive oil from the roasting coats everything beautifully, and the lime zing finishes it off perfectly! Sundried tomato, chickpea and sweetcorn side! Sean doesn’t find any salad, no matter how many ingredients, fills him up, so the chickpeas are more for his benefit. It adds extra protein too, as well as an extra portion of colourful veg! The flavour is just delicious, with the garlic, spring onion, lime and tomato mixing perfectly – you will just have to take my word for it and try it for yourself. Chop the spring onions and mince the garlic clove – fry both in a frying pan until just softening. Add the drained chickpeas and use a potato masher to smash them a bit – not too much! Add the sweetcorn and pour in the stock (I used half a chicken cube but veg would be better). Juice your half lime and add with a bit of zest. Stir in the sundried tomato paste, then take off heat and set aside. And the benefit? Eating like this and doing more exercise (him – gym, me – cycling) and we are pretty much back to how we were before! Thanks to Waitrose for the idea and the vouchers. If you want any other summer salad recipes, be sure to check out the Great British Garden Party page – some lovely drinks and desserts on there too! How splendidly scrumptious looking! I could happily eat chickpeas every day and will certainly be giving this tasty salad a spin. Sounds really good, and vegetarian (c'est moi). 🙂 I might try this. I've always been a big cook, but when my boyfriend and I first started dating we were also eating out a lot. Now that we're living together, I'm cooking more again, and it feels great. The only issue is that I don't eat a lot of meat, and he swears by a paleo diet, which makes for some… interesting meals. But man, that salad looks soooo tasty, I'm going to have to try that out. Anything with roast squash is right up my alley. Wandered over to find your wonderful blog. Love your beautiful style and recipes. Can't wait to read more.